Jim Mandelin was born in rural Alberta to a violent, alcoholic, Klu Klux Klan father and a teenage runaway, homeless kid who became Jim’s mother. His grandmother insisted on caring for him and he was taken from his parents to be raised on her farm from infancy until fifteen years of age. Jim never saw his mother again until adulthood. Though his grandmother did her best to care for him, she was confined to a wheelchair and his care became the primary responsibility of his father’s younger siblings. This they did with great resentment and animosity. Jim endured years of sexual, physical and emotional abuse at home and severe bullying at school. 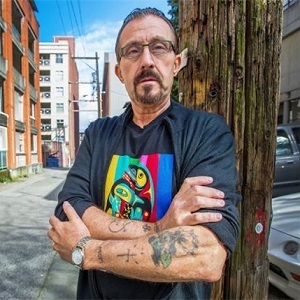 At fifteen years old he ran away to the mean streets of the Downtown Eastside of Vancouver British Columbia where he continued to be abused, selling drug for the gangs, ending up in prison and being recruited into a motorcycle gang. He became a debt collector for the gang and beat people. Life changed for Jim when at the age of twenty two he entered drug rehab where he had a drug induced heart attack and had a near death experience. Although Jim’s story is one of great trials and much sadness, he has lived to overcome a life of addiction, prison life and gang violence. With years of painful introspection and therapy Jim was able to stop his self-abuse, violent behavior and develop empathy for himself. The results of this helped Jim to quit a four package a day cigarette habit, completely change his thinking and behavior and to create a holistic health regimen for himself. With much therapeutic help Jim is now thirty-eight years clean and sober. Jim currently works as an inspirational speaker and counselor sharing his experience and hope with thousands of kids in schools and prisons each year. For the past ten years now he has also taught a course at several Universities to classes of new police officers, prison guards, border guards and parole officers on the topic of Interpersonal Relationships and the Development of Empathy. He is now living happily with his wife (Kids have grown up) in Vancouver, British Columbia. Summary: Jim’s answer to the five questions! Listen to the full conversation on the player above; also available on iTunes and Stitcher. There’s a few. My first hope came from my dog, Lassie, when I was a small child. Lassie hated adults, didn’t trust them and just loved me and my little brother. We called her mum because I grew up without a mum. The most special person is my counselor, Laila Van Steinberg. She was a 60-year-old counselor who was the kindest person I’ve ever met. This poem that I wrote, it summarizes my story from beginning to recovery. My whole childhood was filled with violence. She ran away when I was three; brother was one. I never got one hug after that. My father was a member of the Klu Klux Klan. He drank and then beat everyone up including me. and when I could stand up and not cry he would say “that’s my boy”. My father sexually assaulted me in his drunken darkness. His sister molested me by night, by day. She was just mean. I was terrified by four, peed my bed ‘til I was 15. My uncle beat me often, I never knew why. See, I was always a good kid, always obeyed. One day at gunpoint, my uncle made my brother and I kill our puppies. I was 12, brother was 10. He made us hold the puppies’ head under water. They all died. I started to hate that day and crime entered my life. I was bullied every day in school, even some teachers were cruel. One, she wouldn’t let me go use the toilet. I pooped my pants six times that year in her class. I tried to hang myself by a rope at the age of 11. My aunt cut me down. Severe poverty is what I lived with as a kid. Never had a pair of shoes that fit. Never saw a doctor or a dentist. Pulled one of my own teeth out using a pair of plyers. But then in the streets there were just that different kind. I became homeless, a drug user, a drug dealer and I went to prison. In prison, I was recruited into a gang where I finally got hugged. My gang family swept me up and then soon I truly became violent. At 22, a drug and alcohol seizure led to my cardiac arrest and I was pronounced dead. In this place of death, I had an epiphany which brought me back to life. That was over 38 years ago now and I AM STILL HERE. With the help of some remarkable counselors, I forgave myself, my family and I have moved on. See, I learned that hurt people hurt people. Now, I dedicate my life to helping hurt people heal that hurt – especially kids. I take pride in telling my story and becoming vulnerable. Vulnerability has become my greatest strength. whose stories will never be told because they didn’t survive. I am constantly in a state of introspection and constantly looking at what I can do better. It’s not the smartest, it’s not the strongest, it’s not the most brilliant people that will survive. It’s the one that’s most adaptable to change. People aren’t too adaptable to change and my middle name is change. Anything at any given moment changes for me. (1) Grow inward and know your truth. (2) Do not be afraid. (3) Tell your story to an enlightened witness. (4) Search, rediscover, Google and find out more about changing yourself. (5) Seek of others with the problems you have and share your experience, strength and hope.